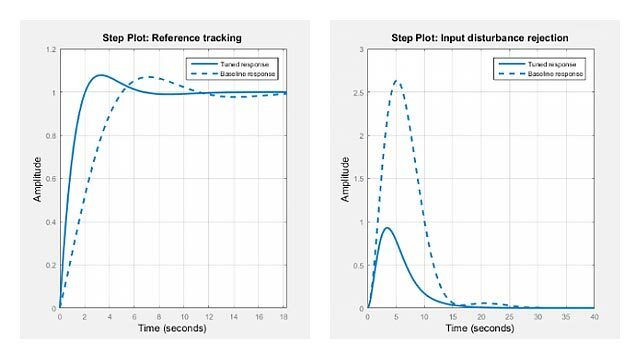 You can add dynamics and modify compensator parameters using the Compensator Editor or using the graphical Bode Editor, Root Locus Editor, or Nichols Editor plots. To open the Compensator Editor dialog box, in Control System Designer, in an editor plot area, right-click and select Edit Compensator. Alternatively, in the Data Browser, in the Controllers section, right-click the compensator you want to edit and click Open Selection. The Compensator Editor displays the transfer function for the currently selected compensator. You can select a different compensator to edit using the drop-down list. By default, the compensator transfer function displays in the time constant format. You can select a different format by changing the corresponding Control System Designer preference. In Control System Designer, on the Control System tab, click Preferences. In the Control System Designer Preferences dialog box, on the Options tab, select a Compensator Format. 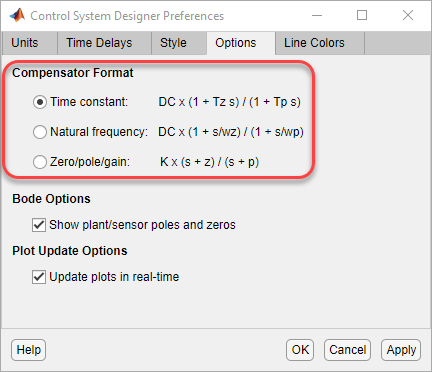 To add poles and zeros to your compensator, in the Compensator Editor, right-click in the Dynamics table and, under Add Pole/Zero, select the type of pole/zero you want to add. The app adds a pole or zero of the selected type with default parameters. 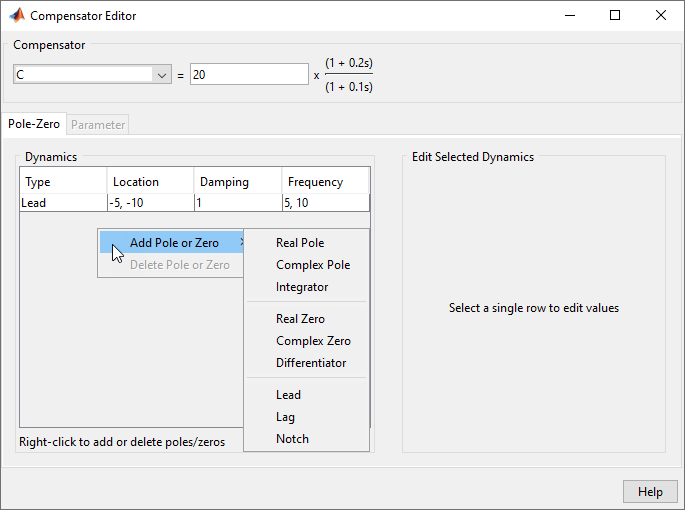 To edit a pole or zero, in the Dynamics table, click on the pole/zero type you want to edit. Then, in the Edit Selected Dynamics section, in the text boxes, specify the pole and zero locations. To delete poles and zeros, in the Dynamics table, click on the pole/zero type you want to delete. Then, right-click and select Delete Pole/Zero. 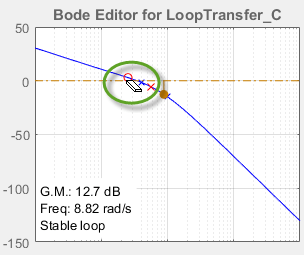 You can also add and adjust poles and zeros directly from Bode Editor, Root Locus Editor, or Nichols Editor plots. Use this method to roughly place poles and zeros in the correct area before fine-tuning their locations using the Compensator Editor. To add poles and zeros directly from an editor plot, right-click the plot area and, under Add Pole/Zero, select the type of pole/zero you want to add. In the editor plot, the app displays the editable compensator poles and zeros as red X’s and O’s respectively. In the editor plots, you can drag poles and zeros to adjust their locations. As you drag a pole or zero, the app displays the new value in the status bar, on the right side. To delete a pole or zero, right-click the plot area and select Delete Pole/Zero. Then, in the editor plot, click the pole or zero you want to delete. Setting the real and imaginary parts directly. Setting the natural frequency, ωn, and damping ratio, ξ.
Integrator — Add a pole at the origin to eliminate steady-state error for step inputs and DC inputs. Differentiator — Add a zero at the origin. You can add lead networks, lag networks, and combination lead-lag networks to your compensator. To add a lead-lag network, add separate lead and lag networks. Specify the pole and zero locations. Placing the pole and zero further apart increases the amount of phase angle change. Specify the maximum amount of phase angle change and the frequency at which this change occurs. The app automatically computes the pole and zero locations. When graphically changing pole and zero locations for a lead or lag compensator, in the editor plot, you can drag the pole and zeros independently. 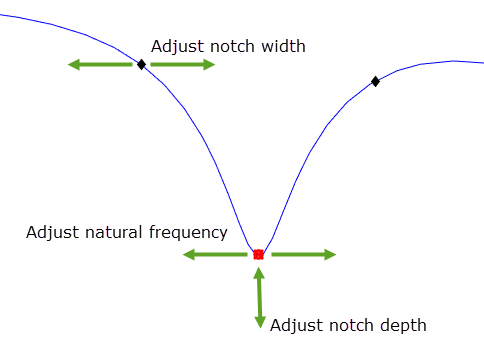 ωn is the natural frequency of the notch. The ratio ξ2/ξ1 sets the depth of the notch. Damping for the complex poles and zeros of the transfer function. When graphically editing a notch filter, in the Bode Editor, you can drag the bottom of the notch to adjust ωn and the notch depth. To adjust the width of the notch without changing ωn or the notch depth, you can drag the edges of the notch.